Macedonian Kingdom, Regional Issues. 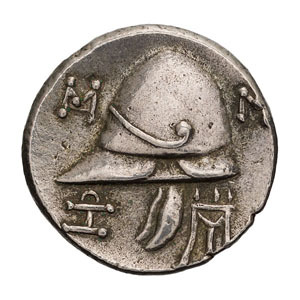 c. 185-168 BC. Tetrobol, 2.42gg. (2h). 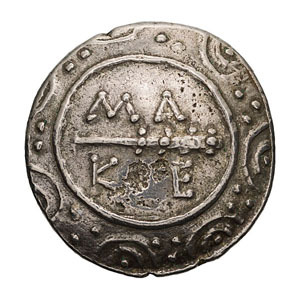 Obv: Macedonian shield; at center, club between MA / KE. Rx: Macedonian helmet left, surrounded by three monograms and tripod. SNG Ashmolean 3279. Mint State. Ex Philip T. Ashton Collection. Purchased from Pegasi, August 2014.